A recent blog post from Cisco Security specialist, outlines how Cisco Threat Response acts like the conductor of an orchestra to harmonizes the various components of your security infrastructure. And with Cisco’s open architecture, the Security portfolio of products works together like an orchestra. Read the full article here. How to regain resources and minutes by reducing time to remediate. Limited to only a small number of places, the aim of the workshops is to teach concepts and techniques of threat hunting. We will be using a unified, cloud-hosted set of data that is integrated across endpoint, DNS, threat research and cloud security tools. 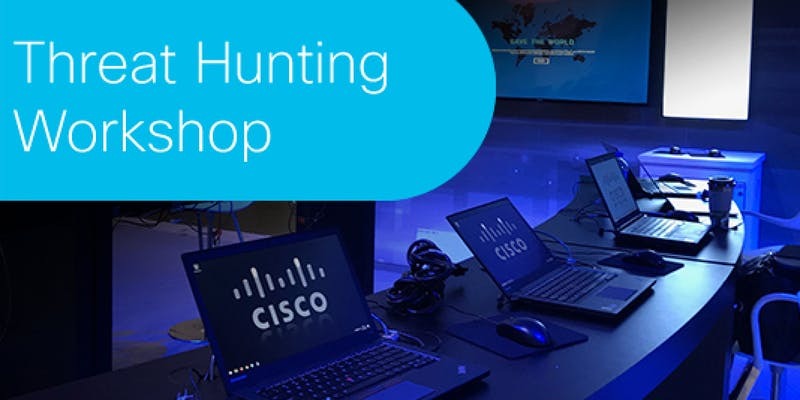 At the end of the workshop you will be armed with knowledge and hands-on experience in hunting down threats and defending networks against advanced adversaries. Network with your peers to share strategies and techniques. Hunt and Contain – a new threat is making headlines and your executives want complete answers fast. You need to know if it is inside your organisation and how to contain it. Catch the Phish – you have evidence that a remote user was phished. Follow the attack from entry to execution. Screenshot holds the clue – there’s not much to go on – just a single screenshot – but that’s all you need to trace the attack back to the entry point. You don’t need to have an in-depth knowledge of Cisco security products to attend. However, we would expect that you would have responsibility for IT security within your organisation. You will be provided with step-by-step guidance, and access to all the required products and tools. Click Here to book a place on one of our forthcoming events.